Drypers diapers are proudly made in Malaysia by SCA Hygiene Malaysia Sdn. Bhd. Drypers are produced in Malaysia. We’re proud that our diapers are made by Malaysians for Malaysian babies. Drypers product innovations are also developed locally by our research and development laboratory. 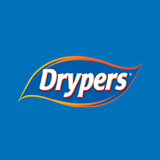 We’ve been making Drypers diapers for over 10 years. While diapers have changed dramatically over that time, what remains constant is our commitment to providing your baby with a good quality diaper with good absorbency to keep your baby dry and comfortable. All Drypers diapers undergo a stringent quality control and testing process before reaching your supermarket shelves. All materials used in our diapers must pass SCA Hygiene Malaysia Sdn. Bhd. 's rigorous Product Safety Acceptance tests.